From our discussion, we came up with four primary motivations (aside from passing the time away) for using apps like Foursquare, and how business owners and marketers can appeal to each specific motivation. Narcissism. 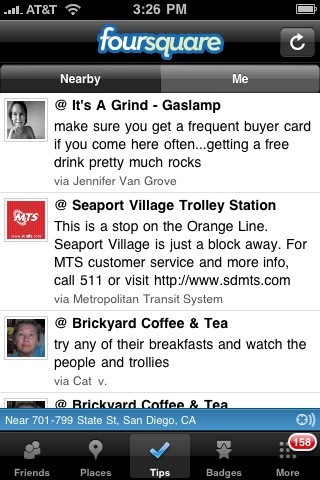 These users want everyone to know what they’re doing and the cool places they’re going to. The most frequent visitor of a certain location can become the “Mayor” of that location, giving them a sort of celebrity status in the Foursquare world. These users want everyone to know that they are the social mavens of the town. Some critics have even dubbed this geo-bragging. Furthermore, check-ins can be linked to Twitter and Facebook, making it easier to express such narcissistic “look at me” tendencies to a user’s broader network. How to appeal to this motivation: Continue to feed that narcissism! For that hip new bar in town, this might mean offering the “Mayor” a photo with the owner, which can then be posted at the bar or shared with friends. Whether it’s massaging user egos and broadcasting how great a user is to his or her peers via Twitter, or offering other means of sharing (photos, videos, etc. ), the more vanity, the better. How to appeal to this motivation: Offer more ways to explore and learn about your local business. 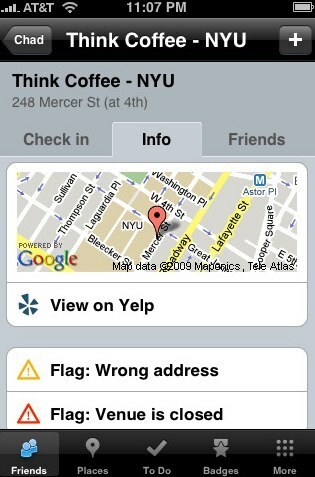 If you own a coffee shop, you could host social events such as Foursquare meet ups to help users meet face-to-face with others who have similar tastes. Users can already read comments and reviews from other users, but as the business owner, you can (unobtrusively) provide much more information. A sporting goods store could post tips on what outdoor activities are best for this time of year. The goal is to help a user feel like they are “in the know” – users want to know the best appetizers, the best draft beers, or best seats at a venue. A constant flow of new information, opportunities to meet others at, or a chance to seem like a “regular” will ensure success. For a product to persist, at some point it has to transition from a hip new thing to something that has functional value. How to appeal to this motivation: This is the probably the easiest to appeal to. Simply offer promotions for those users that check-in a certain number of times. This is a win-win-win. Local business owners get more repeat customers for little cost (a free drink, 10% off), users get their coveted discounts, and Foursquare gets more users to join in on the fun. The Love of the Game. These users are in it to win. They are hungry for badges and pins, and love to have the most unique, the most interesting, or simply, the most amounts. Users can unlock a badge once they collect a certain number of points from their check-ins. For example, you get the “crunked badge” when you check in four times in one night. 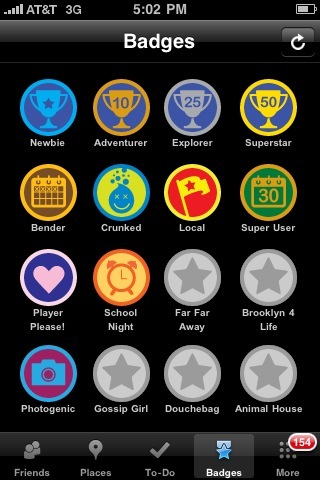 (Here is a list of Foursquare badges and how to unlock them). Other aspects like the Mayor-status also tie into the gaming function of the app. The love (read: addiction) to the game is comparable to that of Facebook’s Farmville. Of course, the game has to evolve in order to keep users engaged. How to appeal to this motivation: The competition is what drives these users, so make the game more challenging by adding more difficult badges for users to unlock. A BBQ Wings restaurant could offer a special badge for those that 10 of their spiciest wings. If a local restaurant starts to create their own badges, this may even encourage other customers to create custom challenges and badges for their friends, driving them to go to visit that restaurant as well.